Various farmers markets are taking place regularly in a Geneva's beautiful countryside and in the city as well, offering the most fresh and locally grown fruits and vegetables, dairy products, eggs, meat, sometimes also home made wines, honey, pâtisserie, breads and much more. The biggest and most famous farmers market in the city, happening on Tuesday, Thursday and Sunday at Plaine de Plainpalais. 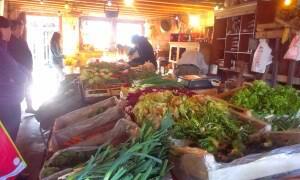 Huge variety of fresh and quality produce, smells and tastes will entertain Your senses. Hours: From morning (~9am) until around 3-5pm on Sunday and around 1-2pm on Tuesday, Thursday. Market is taking place also during the rain, at least partly. On Saturday there is a fle market at the same place happening. Taking place at Boulevard Helvétique ~30 (street gets closed for cars and opened for market). Open Wednesdays and Saturdays from morning till 2pm, many local farmers come here to offer their locally grown veggies but also imported exotic fruits. Smaller farmers market with few stalls of fruits, veggies and also flowers, located directly in the city centrum, at the edge of Geneva's main shopping street Rue du Marché. Every Wednesday and Saturday, from morning till about afternoon, The Place du Marché at Carouge gets filled with fruits, veggies, cheese, honey, meat and breads stalls and many local people wandering around and filling up their bags. This farmers market happening at the local barn in a Geneva's countryside is offering truly locally grown and seasonal fruits and vegetables, cheese, eggs, bread and meat on the request by a friendly only French speaking farmer's family.